The following is a copy of an application I just sent to the following grant opportunity by the Bill & Melinda Gates Foundation: “Grand Challenges Explorations: Innovation for WASH in Urban Settings (Round 22)”. 2. How will you test your idea? Composting toilet with urine separation. Odor extraction system, using tubes, a fan, and a photovoltaics panel. It also dries the feces. Feces container for 250-300 l or about 170-200 kg of semi-dried feces. Stairs-going sack barrow, customized for transporting the feces containers. Mechanical versions operated by two people are the standard. An electrical version for one person is possible. Vehicle with a lift or ramp to transport the feces containers from the nearest road access point. Steam autoclave, customized for the feces containers. In the utility scale version large enough for many feces containers. Possibly locally made with reinforced concrete. Composting and soil mixing plant. Management software to organize the logistics of the feces containers. Including a feature to predict when containers are probably full and should be exchanged, and automatic tour planning. The toilet rests on top of the feces container. A visual and odor barrier opens when sitting down on the toilet seat, while a small solar-powered fan extracts odors from the tank. When full, the container is sealed and exchanged by a professional crew on request, using the special sack barrow and a vehicle. It is then autoclaved as a whole, which is possible for a container made from polypropylene, aluminium or stainless steel. This prevents any handling of potentially infectious, unsanitized feces. After heat sterilization, the (now harmless) container contents are composted, mixed with rock dust and organic matter to form fertile soil, and the soil is sold to farmers. Due to this revenue source, container collection can be a free service. A successful product requires the right tuning of parameters. In this case, the right scale of the feces container is critical: small containers need frequent handling, usually by end users, which is unsafe and socially unacceptable; large containers (like 1 m³ IBC tanks) are not suitable for transport in narrow courtyards and streets; and the even larger septic tanks are expensive to build, pose groundwater risks, and require unsafe open handling of feces for emptying them. The best scale for urban settings is our medium-sized 300 l container: it fits under a toilet, needs infrequent emptying (after 3 person years of use), and can be transported with a sack barrow up and down stairs and through narrow passages. Our approach is unconventional as at-source collection of human waste is not practiced in cities. However, we argue that it is the way to go because (1) the food economy must be circular if we are to solve the issues of soil nutrient depletion, topsoil loss and water eutrophication, (2) collecting and sterilizing human feces before they mix with water or touch anything is microbiologically the safest approach in developing areas and (3) both installation and operation are cheaper than that of a sewered sanitation system with a sewage treatment plant. Claims (2) and (3) will be tested in this project. We estimate a high probability of success because we designed a system that respects the operational constraints: social acceptability, use incentives, simple and safe processes for developing areas, independence from fragile infrastructure (like grid electricity and client-side electronics), usability in constrained urban spaces, and extreme affordability (because the toilets themselves are “low-tech”). We will develop and build several (4-10) prototypes of the proposed toilets, tanks and the sack barrow. We will rent (or if necessary build) a steam autoclave fitting for one container, as used for sterilizing soil in mushroom farms. We will perform extensive, long-term, real-world testing of all components, use the resulting compost and soil on a test plot, and test it microbiologically and for soil quality. All of this will happen in Kathmandu Valley, Nepal, an urban agglomeration of 5 million without wastewater processing. We will use online and offline ethnography to collect and evaluate feedback and input from users of the toilet, from those handling the containers and autoclave, from local politicians and citizens in general. With this, data from the prototype use, and input from industry about production costs, we will create a detailed report of the feasibility, design and cost of introducing and operating the proposed system at city scale. We will also include risks and ways to mitigate them, esp. related to cultural sensitivities and social acceptance. The report will include detailed instructions how to manufacture the system locally. All intellectual property incl. the reports and management software will be licenced and published under open source licences. If we find the proposed system to be technologically feasible and economically attractive, we will contact city administrations in Nepal and beyond and at first propose a deployment for 5,000 – 20,000 people. Scale will increase with follow-up projects until reaching full city scale. We intend to work as tech consultants for city administrations to promote the proposed technology instead of starting a manufacturing company. This keeps capital costs down and allows cities to source the system components from local, existing manufacturers. We’re also open to consult for private companies, if their container exchange service is free for end users. In case there are technical difficulties with the proposed system, we may require some funding for further research and development. One possible area of concern is the energy use of the autoclaves. This section was not included in the application sent off due to space constraints. Towards a circular food economy. It is quite amazing how food is completely recyclable. The body extracts chemical energy but leaves the atoms intact (obviously). So by composting feces and urine into soil and agriculturing soil into plants, a low-tech closed loop recycling is possible. It could even be automated to a large degree. This way, there is neither soil loss, soil exhaustion nor nutrient deficiency in the food. Which means that composting toilets and agricultural use of feces is certainly the right way to go. Challenges of dry toilets in cities. The main problem with dry toilets in cities is social acceptance. From a failed experiment with dry toilets in China: “[Dry toilets with a bucket] are ill-matched for the aspirations of urban middle class life. What’s unacceptable is you have to carry a bucket of your own feces down for composting.”. Also, it is difficult to adapt non-sewerage sanitation to the density of cities (for an overview, see here). However, the system proposed here is (hopefully) an exception. Soil, not biochar. The end product here is soil, not biochar as in many other systems. That seems to be the “right” solution in order to return all nutrients to the soil in biologically active form. Use of litter material. Moderate amounts of litter should be used in the dry toilet, but it is not essential. On ventilation. The toilet will use forced ventilation but close very tightly, so that the ventilation only turns on when the toilet is in use. This way, there will be no odor issues outside even when all households use these toilets. Obviously this also means that feces are not dried by air motion, but that is not an issue: it’s not worth the energy input, as the end product (soil) can use the humidity. Indirect autoclave heating. The heat might come from vacuum tube type thermal solar collectors with a high-temperature heat fluid (150 °C silicone oil). Direct solar autoclave containers. This is probably the best solution so far, as it does not need separate autoclaves and works with “just sunlight”. For this, the feces container itself has to be pressure-proof for working pressures of ca. 2 bar pressure differential (as seen in 120-130 °C steam during sterilization). For testing purposes, stainless steel 200 l beer barrels are good options, while for serial production barrels welded from aluminium sheet metal can be used. These containers are closed with a pressure-proof lid, painted black on the outside and a pressure gauge is added. For better heat retention (in cold areas or where direct sunshine collector surface is rare) it is optionally possible to place the container inside a cylindrical enclosure made from heatproof glass sheets connected by metal elements. Now, the containers are raised into the focal point of a small concentrating solar power plant and rotated slowly. Rotation allows the heat to be taken up faster by the material and also allows the steam developing from water in the material to penetrate the material faster as well, as it is all exposed to it at some time. When the sun goes down, heating can be resumed the next day (as total time spent at a certain temperature and pressure is essential for sterilization, not an uninterrupted process). When there is no direct sun, there is no rush: the plant will have enough spare containers and wait for the sun to come back. In total, this is a pretty low-cost, low tech form of sterilization. Of course, it needs a large area that receives enough direct sun. Solar electrical autoclave containers. This is probably an even better solution than exposing autoclave containers to concentrated sunlight, because it allows to use the grid as a buffer and thus works also on cloudy days (taking grid electricity as a supplement) and can also supply energy to the grid when not all is needed locally. The cheapest and most practical option in this case will be to use aluminium containers that are not pressure-proof and loaded into an autoclave. These containers would however have multiple aluminium tubes going through the container, open on both sides, in a grid of 10×10 cm to 15×15 cm. These stabilize the container walls but, more importantly, allow to insert electrical heating rods using nicro wire, heated by either 230 V AC grid electricity or 230 V DC solar electricity, depending on which is available, with switchover possible every few seconds. Both will result in the same heat output since 230 V AC is the effective (averaged) voltage. Since there are many heating rods and aluminium is a good heat conductor, heating the content up to sterilization temperatures will be possible much faster than with an alternative system of contact only to the outside surface of the container. To save energy, a second device would contain a fluid-based heat exchanger that transfers heat from already sterilized to cold feces containers. Using several steps for this, perhaps 60-70% of the heat can be recovered. For that heat transfer, the same through-holes in the containers can be used, just this time routing hot or cold water through them. Use the soil on farms, not in the city. For social acceptance, city people probably don’t want to see the end products of their feces again. Farmers however have no such issues, they are used to animal manure already and will recognize heat-sterilized humanure as a safe, great fertilizer. Also, there will not be much use for so much soil in a city anyway, and the soil has to be restored where it was depleted: on farms. Use the urine on farms as well. Urine would be stored for 6 months (or also heat treated) to render it safe and then transported to rural locations. Here, it would be automatically mixed with water and be available for free to farmers at a dispensing point. For the urine of each one person, a garden of 250 m² will be needed to prevent groundwater eutrophication (see here), which is not possible in cities. Alternative containers for larger houses. For large apartment blocks, esp. newly built ones that can be built around this new toilet system, 1000 l IBC tank pallets are a much better option. Due to its size, it only has to be emptied every 6-7 person years (so 2-3 years with 2-3 people in an apartment). The toilet can be mounted above it, or at floor level if the IBC ends flush with floor level due to a special construction of the house. In this case, an elevator with “secret” intermediate stops can be built and then is used together with a normal pallet truck to exchange these containers without even having to enter people’s flats. Existing IBC based dry toilet. 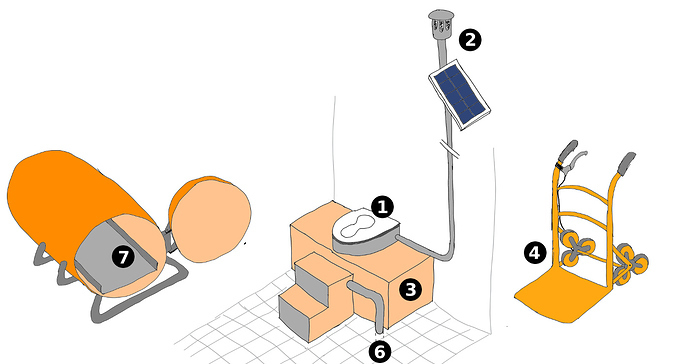 There is a great Instructable on an IBC based outhouse toilet: part 1, part 2. Interesting points include that composting only happens once the contents start to dry (having the lid open), and then progresses from top to bottom. However, this is when adding no litter (which is of course good to extend the use time of a IBC container). But using forced ventilation, drying could also happen during use. IBC based public toilets. Note that the solution with IBC containers can also easily be deployed for public toilets. That makes it immediately applicable as a solution for informal settlements / squatter areas of cities. Decentralized composting with spare containers. By having two feces containers in one household, next to each other, one can be composting the ingredients when full while the other is in use. Since composting takes less than a year, there is also plenty of time to call the service providers for exchanging the container after the compost is ready. This is basically “distributed storage” rather than storage and composting at a central facility, and this way also prevents odor problems at a central facility. Using the system to dispose of food scraps. The proposed toilets can double as indoor compost heaps for organic trash. This will probably be more comfortable to citizens than managing a separate organic trash bin, with all the stink and slimy dirt involved when having to empty and clean it. It makes the toilet tanks fill up faster (maybe twice as fast) but it is still manageable. Dry organic material like leaves and sawdust will have to be added to manage the humidity (avoiding “stinky” anorganic digestion), but the service providers can bring that when exchanging the container. Also, old paper can be used as well. From feces disposal to feces mining. The most amazing possibility in this system is that it transforms feces (but also urine) into a safe, valuable agricultural resource. So ideally, the business model would be profitable without charging users anything, solely from selling compost / soil. That seems possible, because with compost prices of 65 EUR/t in developing countries or 90 EUR in developed countries, one container with 300 l or 250 kg of compost would be worth 16 - 22 EUR, certainly enough for free pickup in a city when using a system of combined, automatically optimized collection logistics. There could even be well-maintained and free to use but still profitable public toilets everywhere in cities. That is a bit of a stretch though, as the 200 g of semi-dried feces (equiv. to compost) of one defecation are worth only 0.013 EUR in raw materials. At the maximum of 100 users per day and toilet, that might allow cleaning a toilet once per day in a developing area. But we did not even include the labor to process the compost yet. Additionally, the compost has to be heated to sterilize it, which again costs something. How much soil can be produced? Let’s assume an urban agglomeration with 5 million residents and no proper sewage treatment (that’s Kathmandu Valley). A human being produces on average 100 kg of feces per year, which is 65% water. Drying as needed for use in compost / spoil might remove 45% water, leaving 55 kg. There will be some weight loss through CO2 and methane during composting, so let’s assume the yield is 45 kg of compost. At 5 million residents, that’s 225,000 t compost per year, or 616 t per day, equivalent to 31 large dumptrucks carrying 20 t each. Adding other biomass to create soil and not just compost as a product, the yield can be 2-3 times higher (but is better done on the farms using the compost to prevent unnecessary transportation). Usage incentives. When households without any access to a sanitation solution get a clean, safe toilet where waste disposal costs nothing, that itself should be incentive enough. Where they already have a sewer connection, there are still incentives: they will no longer have to pay wastewater fees to the municipality (often based on the amount of freshwater used), they will save the water for flushing, and the installation of the standard model of the toilet might even be free as well in exchange for a long-term contract allowing the company free collection of the waste. Preventing antibiotics contamination of the environment. When excrements are collected at source, it is simple to solve one of the problems that still plague current central wastewater treatment plants: residues of medical drugs, esp. of antibiotics because they could induce antibiotics resistance. For that, homes would simply have a second, smaller separating dry toilet that people are required to use while they are on certain medications. Feces collected from these toilets would be burned, and likewise urine would be evaporated and the residues burned, eliminating all traces of antibiotics. Alternative business model: charge a fee, but create forests for free. Probably a better business model is to charge a fee to toilet users (or, in the case of informal settlements where people cannot afford it, to the city). If the fee is lower than usually charged for sewered sanitation, cities people still have an incentive to switch to this system. That fee enables to, on the other hand, provide a free service to the environment: using the soil produced with this system to plant forests on denuded mountains. This enables “land based land reclamation” by exploiting the fact that, due to climate change, forests are now viable at higher altitudes if only there would be soil. Also, this use of the soil will create even fewer social acceptance issues than its use on farms, and the forests can still be useful by using many plant species that produce fruits, sap or essential oils or are otherwise useful beyond their wood. Obviously, the land created this way can become quite valuable in the future, when productive land in cool locations is desirable. It’s 10% of the solution for CO2 emissions in a low-emission country. Assume a country like Nepal with no proper wastewater treatment at all and ca. 2 t CO2 emissions per person and year. Let’s assume the 100 kg of feces produced per person and year contain 33 kg carbon, which results in ca. 100 kg of CO2 equivalent. In addition, the forest growth enabled on soil created this way (using the business model above) might add another 100 kg of CO2 sequestration per year. That’s offsetting 200 kg / 2 t = 10% of a person’s emissions. Of course, not all carbon contained in untreated wastewater goes into the air as methane or CO2, so this is only a rough calculation. But still, it’s a meaningful and free way to offset CO2 and it does not use up any previously useful land – instead, it creates useful land. Using microwaves for drying and sterilization. As can be observed from putting a slice of bread for three minutes into a microwave oven, microwaves are effective for heating and drying and even for conversion of organic matter to biochar. A great advantage of microwaves is that they heat the material volumetrically, which is much faster than heating through surface contact and usually also more efficient, as there is less time for heat to get lost. Microwave heating can be combined with the pressure vessel technique from above, since thick plastic tubes are both resistant to the pressure of heat sterilization (ca. 2 bars working pressure) and transparent to microwave radiation. And even if not, the plastic container can be placed inside a pressure vessel together with the microwave magnetrons, and that pressure vessel would be slowly pressurized with air to always counteract the pressure building up in the thin-walled plastic container inside it. This way, nothing will leave that plastic container during the heating process. Amazing. This deserves going forward! Update: we didn’t win with our application at Bill & Melinda Gates Foundation. The response did not give any specific reason. Social enterprises, such as Sanergy in Nairobi and X-Runner in Lima, gather waste from dry, container-based toilets in urban slums before turning it into products like fertilizer, animal feed, compost and biogas.